1 Was ist das? Präsens (present), Vergangenheit (past) or Zukunft (future)? Do these sentences describe an event in the past, present or future? 1. Ich gehe heute in die Stadt. Present 2. Ich gehe morgen in die Stadt. 3. Ich bin gestern in die Stadt gegangen. 4. Ich werde nächsten Sommer nach Berlin fahren. 5. Ich fahre nächsten Monat nach Paris. 6. Ich bin letzte Woche ins Kino gegangen. 7. Ich habe letzten Montag Fußball gespielt. 8. Ich schreibe morgen einen Brief. 9. Ich esse jeden Tag Cornflakes. 10. Ich werde am Freitag mit meinen Freunden ausgehen. 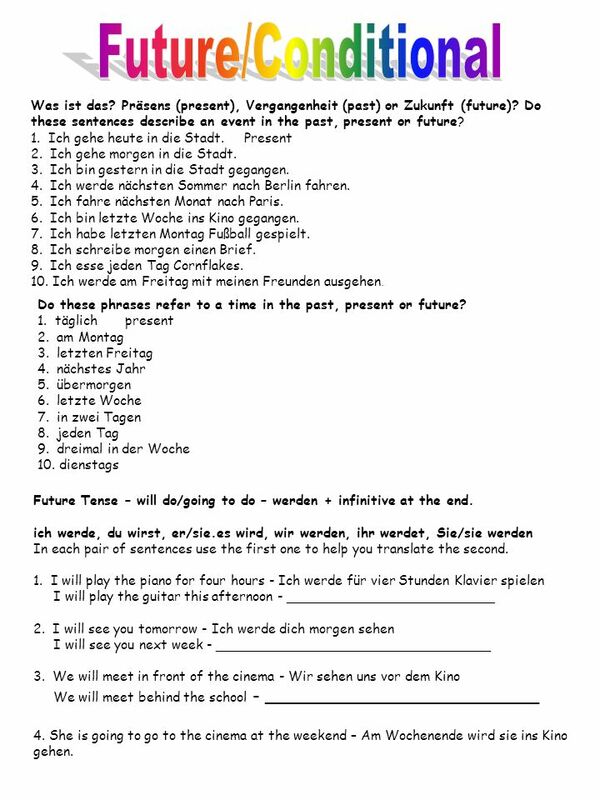 Do these phrases refer to a time in the past, present or future? 1. täglich present 2. am Montag 3. letzten Freitag 4. nächstes Jahr 5. übermorgen 6. letzte Woche 7. in zwei Tagen 8. jeden Tag 9. dreimal in der Woche 10. dienstags Future Tense – will do/going to do – werden + infinitive at the end. 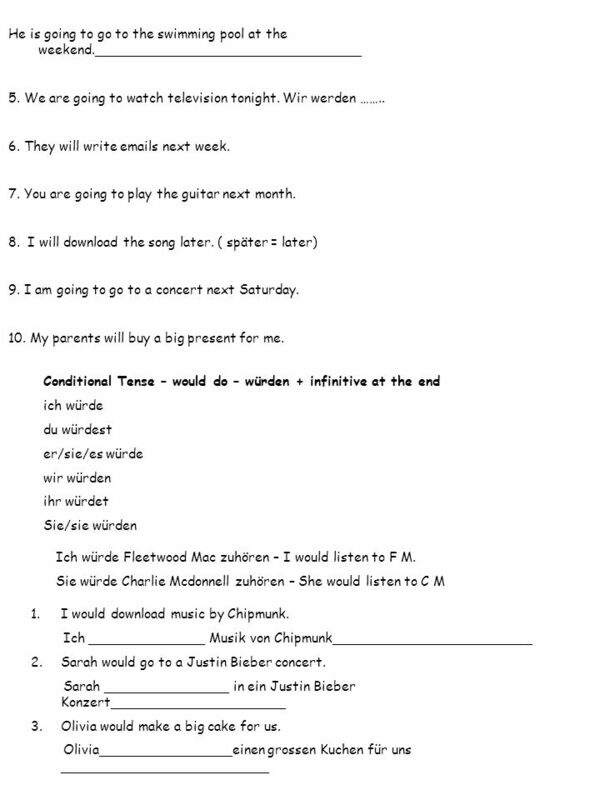 ich werde, du wirst, er/sie.es wird, wir werden, ihr werdet, Sie/sie werden In each pair of sentences use the first one to help you translate the second. 1. I will play the piano for four hours - Ich werde für vier Stunden Klavier spielen I will play the guitar this afternoon - _________________________ 2. I will see you tomorrow - Ich werde dich morgen sehen I will see you next week - _________________________________ 3. We will meet in front of the cinema - Wir sehen uns vor dem Kino We will meet behind the school - _________________________ 4. She is going to go to the cinema at the weekend – Am Wochenende wird sie ins Kino gehen. 3 4.Lucy would sing in a band. Lucy _______________in einer Band_____________ 5.Eden would play the harp. Eden _______________ die Harfe ____________________ You can use würden +infinitive to put any verb into the conditional. It is straightforward and easy to use. There is a shortcut however for the verb mögen – to like. It is just to make things easier! You can say Ich würde ein Eis essen mögen – I would like to eat an icecream. BUT there is a shortcut for this verb and you can say Ich möchte ein Eis essen – I would like to eat an icecream instead. SO ich möchte is exactly the same as ich würde ……..mögen only it sounds better and is easier to use! REMEMBER ich möchte = I would like 1.I would like 2.I would buy 3.She would go 4.He would like 5.They would travel 6.I would like a new car. 7.I would buy a guinea pig 8.She would go to the cinema. 9.He would like a beer. 10.They would travel to Germany. Herunterladen ppt "Was ist das? Präsens (present), Vergangenheit (past) or Zukunft (future)? Do these sentences describe an event in the past, present or future? 1. Ich gehe." Future Tense. When is the future? Any time after the present…..so….any time after RIGHT NOW.